Vocal Alchemy Choral Concert: Pinkham Cantata and Music for Organ and Brass West End Christian Reformed Church. Traffic Jam, First Presbyterian Church. 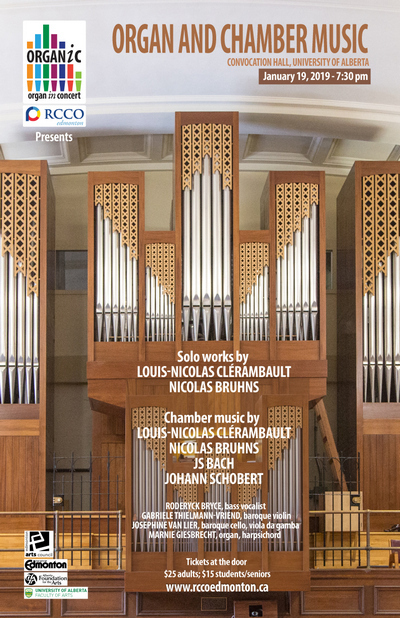 Edmonton RCCO Organ in Concert Series, in cooperation with the Department of Music, University of Alberta, presents virtuoso music for voice, organ and strings: solo and chamber organ works by Louis-Nicolas Clérambault, Nicolas Bruhns and Johann Sebastian Bach at Convocation Hall, Old Arts Building, University of Alberta on January 19, 2019 at 7:30 pm. Performers: Roderick Bryce, baritone vocalist; Gabriele Thielmann-Vriend, baroque violin; Josephine van Lier, baroque cello, viola da gamba; and Marnie Giesbrecht organ and harpsichord..
Acclaimed Scottish baritone Roderick Bryce brings exceptional drama and brilliance to two solo cantatas and Gabriele Thielmann-Vriend evokes charm and virtuosity with her baroque violin. In addition to viola da gamba, Josephine van Lier showcases a cello made in London, England by John Sexton around 1725 that is in its original condition. Marnie Giesbrecht performs exciting solo organ works and a lively Harpsichord Trio by Johann Schobert. Adding to the variety of chamber music is a “premiere” by an Anonymous English composer (Anon c. 1780) for cello and continuo. This promises to be a very special evening full of exquisite music for combinations of baritone (voice), violin, cello, harpsichord and organ complemented by delightfully vibrant works for solo organ. Tickets available at the door. $25.00 general; $15.00 seniors and students. Knoppers Hall, King’s University; 9125-50 Street, Edmonton, Alberta. A piano concert celebrating the fruit of the sabbatical of Joachim Segger. Musical reflections on hymns, old and new. 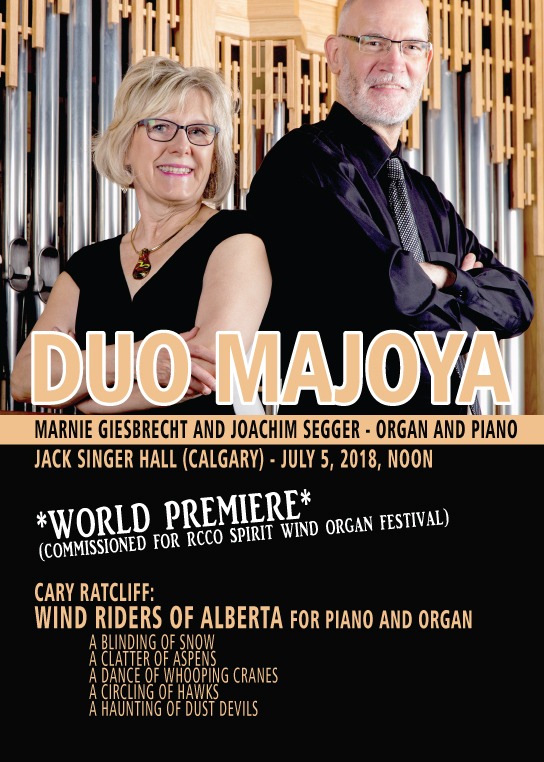 We are very excited about our program for Calgary’s Spirit Wind Organ Festival! 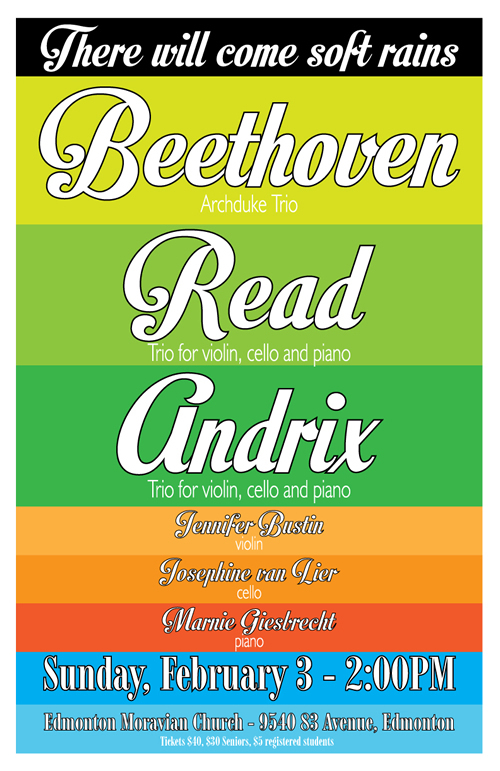 All the works were composed for us by Canadian and American composers. Zachary Wadsworth’s “Tarantella: Black Fly Season; and Meditation: The Aurora in Snow” reflect some of our shared western experiences. Joe Utterback’s jazz-influenced “Ballade” and the foot-stomping “Jubilee” we performed and recorded in Jack Singer Hall on the CD Skyscape (2002). American composer Cary Ratcliff who hails from California and now lives in New York composed a suite of tone poems for this occasion called “Wind Riders of Alberta for Piano and Organ” (notes below). Rounding out our lunchtime musical feast of music that fits under western skies are two colourful movements form Calgary-born composer John Burge’s “Cathedral Architecture: Gargoyles and Windows”, Jacobus Kloppers’ tender setting of “Last Rose of Summer” and Finale from “Duet Suite for Organ and Piano” by Denis Bédard which perhaps reflects a type of “Bonanza” theme reminiscent of the older wild west. High winds keep already-fallen snow airborne, moving sideways. 2018 saw record-breaking snowfall in Calgary. The slightly brittle sound of Aspen leaves, that shake with the slightest wind, carry across a placid lake on a hushed afternoon. The principal nesting grounds of the endangered North American Whooping Crane are in Wood Buffalo National Park, north of the oil sands, straddling the border with the Northwest Territory. There Whooping Cranes dance, a courtship display involving hopping and waving of wings. With the next generation, they fly over Alberta and the United States to winter on the Gulf coast of Texas. Riding the rising thermals next to mountains, Hawks can glide with virtually no effort. Large groups of circling Hawks, called kettles or boils, often form, ‘resting’ prior to migration. Cylcones can form as heated air rises from the earth. If a cylcone touches the earth, dust can be pulled up into it, making the cylcone visible as a spinning ‘dust devil’. But when the cyclonic activity dissipates, the dust stops spiining and floats to the ground. Dust devils toggle into and out of existence. 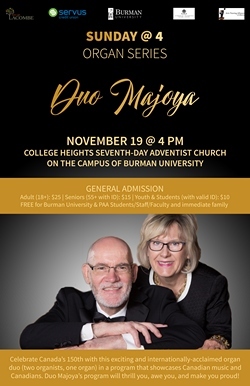 The concert features a new work recently commissioned by Ken Munro for Duo Majoya. Composed by prize-winning composer Zachary Wadsworth the work is dedicated to the memory of Ken Munro’s brother George Munro with whom he grew up and spent many happy years in Longlac, Ontario. The themes in the various movements conjure enchanting scenes from nature as well as reflections on the seasons of our lives. Zachary Wadsworth’s music has been praised for its “evocative mixture of old and new” and has established him as a leading composer of his generation. Originally from Richmond, Virginia (b. 1983), he holds degrees from the Eastman School of Music, Yale University and Cornell University. Wadsworth was teaching at the University of Calgary at the time he composed “Longlac Tableaux” and has recently accepted a position at Williams College in Williamstown, Massachusetts. 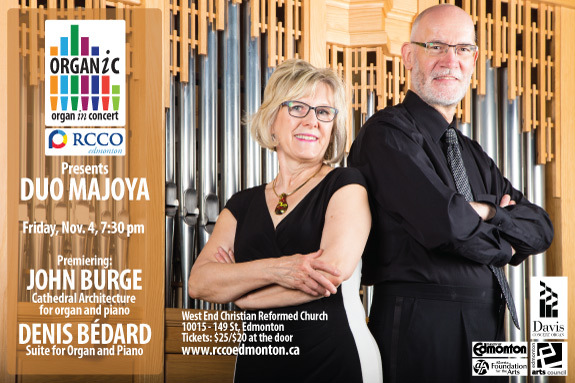 Also on the program is ‘Suite for Organ and Piano” by well-loved Canadian composer Denis Bédard, whose work composed for Duo Majoya in 1999 gained immediate acclaim and inspired performances and works for organ and piano across North America. 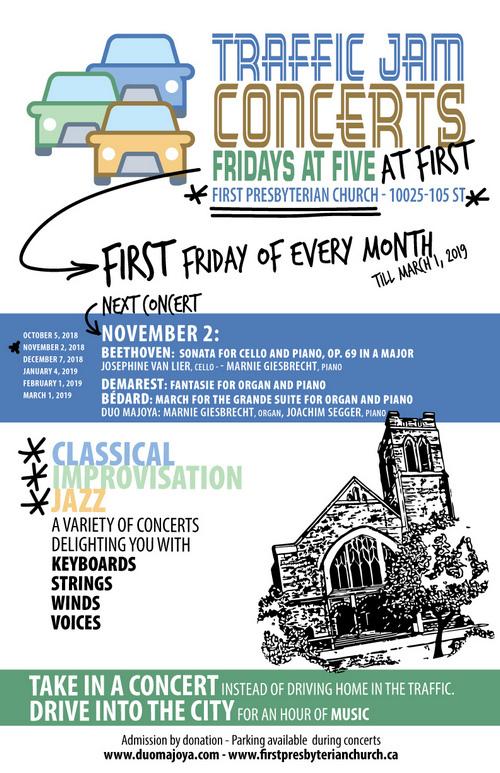 Rounding out the program are works by American jazz pianist and composer Joe Utterback and Australian/Canadian organist and composer Barrie Cabena. 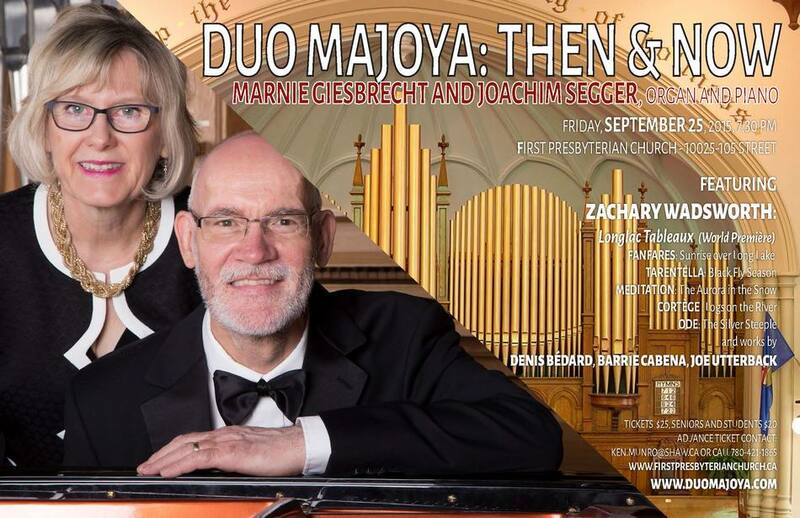 This concert is a benefit and official launch of the “Mary Giesbrecht Memorial Music Endowment Fund”. 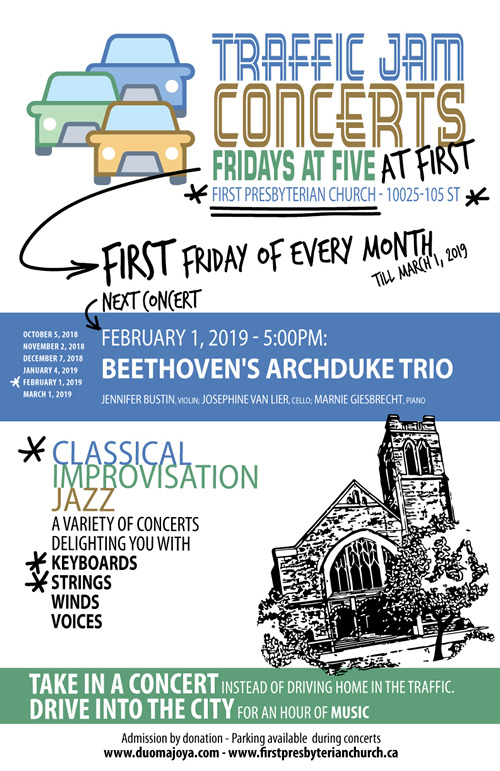 The fund will support music at First Presbyterian Church and will ensure that instrumental, vocal and choral service and concert music thrive now and through the years. 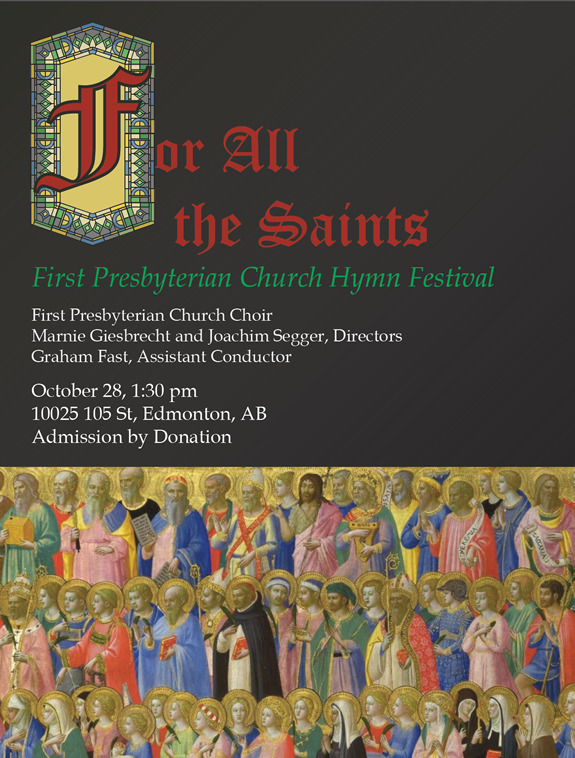 All proceeds from the concert and any donations will be deposited to the fund, which honours long-standing choir member Mary Giesbrecht. 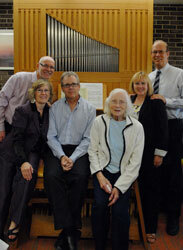 On October 11, 2011 the University of Alberta welcomed a new positive organ. 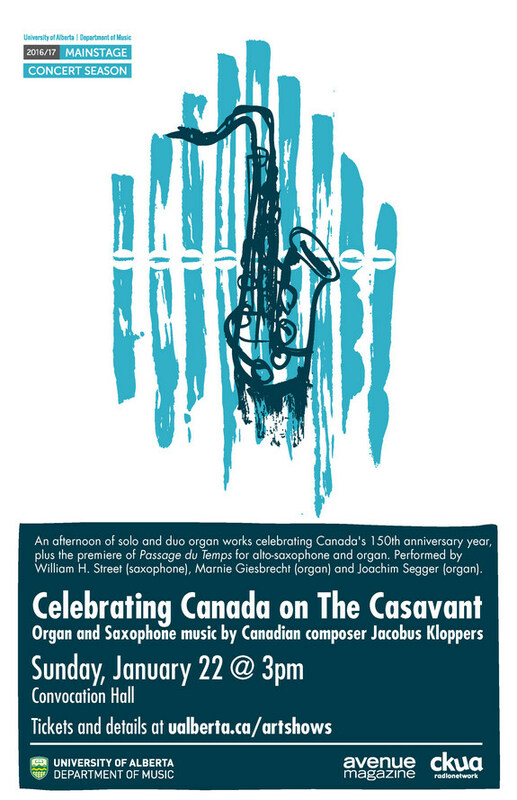 Built by James Louder » of Montreal, the organ is named the Krapf Memorial Organ after the late Gerhard Krapf, who taught organ at the U of A from 1978 to 1987. The organ has a split keyboard with 5 stops: Bourdon 8, Principal 4, Flûte à cheminée 4’, Dessus de Nasard 22/3’ (treble only), and Flûte à bec 2’. The keyboard is transposable to 440, 415 and 392; its native pitch and tuning are at 415. The Krapf organ is currently tuned to a well temperament created by John Brombaugh and modified by James Louder. The voicing is smooth and gentle — it is a beautiful instrument in every way! 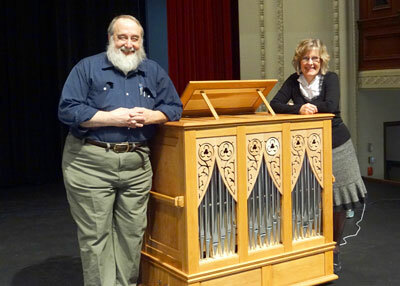 The builder demonstrated the organ to a group of students and guests on October 11, 2011 in Convocation Hall, where the organ resides. 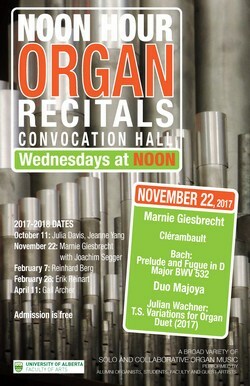 At the Monday Noon Hour Concert on October 24, 2011 the organ was first heard in concert; works by Frescobaldi and Zipoli were performed by Marnie Giesbrecht (faculty) and Cynthia Luk (undergrad). 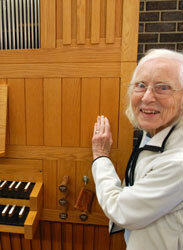 The formal dedication/inauguration of the organ is scheduled forFriday, March 9, 2012 at 8 PM. Members of the Krapf family will be in attendance and donors will be officially thanked. In the Department of Music we are excited about how the new organ will boost our early music performance and teaching activities. Craig Humber, Canadian concert organist living in Vienna, gave a masterclass on German Baroque Organ Music at the University of Alberta, co-sponsored by Early Music Alberta, Feb. 11, 2012. Craig was in town to perform on the RCCO Sundays at 3 Series. 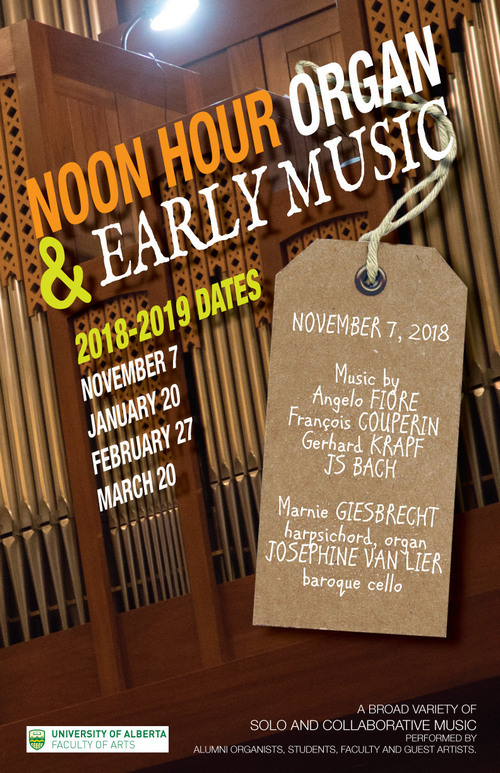 Subsequently two students, Wendy Nieuwenhuis and Hyejin Lee, studied with Mr. Humber in and around Vienna on historic instruments in spring, 2012. Craig Humber was one of the first recipients of the prestigious national RCCO Godfrey Hewitt Scholarships; Wendy Nieuwenhuis is the 2011 recipient. 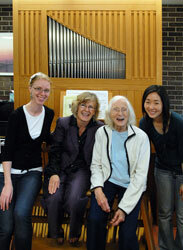 In September 2011 we honoured Carol Otto for her donation of the 1978 Casavant Studio Organ with a short celebration of music and refreshments;Carol was presented with a University of Alberta Faculty of Arts Certificate of Appreciation. In September 2010 the organ was dismantled and moved from Carol Ottos home to Fine Arts Building 3-3 at the University of Alberta. Master organ builder Steve Miller moved the organ with the help of Bruce Hettinger, Debi Harris, Greg Walker, Joachim Segger and Marnie Giesbrecht. Steve Miller reassembled the organ and prepared it for the September 2011 celebration. Joachim Segger, Marnie Giesbrecht, Wendy Nieuwenhuis and Hyejin Lee performed at the celebration. Wendy Nieuwenhuis, Marnie Giesbrecht, Carol Otto, Hyejin Lee. 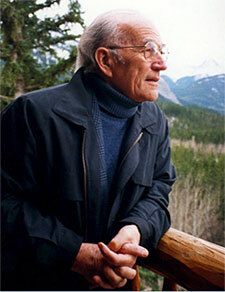 My former teacher (DMus, University of Alberta) and dear friend Gerhard Krapf passed away on July 2, 2008. A memorial concert was held on December 12, 2008 at Convocation Hall, University of Alberta. It featured performances by Gerhild Krapf, Marnie Giesbrecht, Jacobus Kloppers, Eileen Armstrong and others. Gerhard Krapf, Professor Emeritus, University of Alberta, former AGO and RCCO member, born Dec. 12, 1924, passed away on July 2nd, 2008 after a long illness. He is survived by his wife Trudl, three daughters and a son. Gerhard Krapf was renowned for his significant contribution to church music with prolific compositions of organ, choral and vocal works; for the designing and supervision of the 1978 Casavant Organ in Convocation Hall at the University of Alberta; scholarly works on the organ and a decade of teaching at the University of Alberta from 1977 to 1987. His distinguished career, along with building the undergraduate and graduate organ programs at the University of Iowa prior to his appointment at the U of A, contributed significantly to the development of the graduate programs in keyboard and library resources at the University of Alberta, and the first Doctor of Music degree in Organ Performance at an English speaking Canadian University. A champion for tracker action, the U of Iowa was the first American State University to acquire a mechanical action instrument (Casavant) and the U of A followed suit upon Krapf’s faculty appointment. A dedicated and brilliant teacher of organ and related subjects, theory and counterpoint, it was said he could improvise a six-voice fugue. Those of us who had the privilege of working with him will remember his amazing intellect and accomplishments, his devotion as a teacher and friend, his deep Christian convictions and his delightful sense of humour.